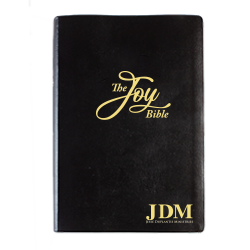 To celebrate the joy of being in ministry for 40 years, Jesse Duplantis Ministries is excited to release The Joy Bible. This special Anniversary Edition Bible features an article by Jesse entitled “Living in Joy,” along with 2 pages of scripture-based confessions which have inspired the love and joy of the Lord for which Jesse is known. This black, bonded leather, parallel Bible sets the King James Version next to the Amplified Bible, Classic Edition for a quick, side-by-side comparison. It also features large, easy-to-read print, and the KJV has the words of Christ in red letter. May The Joy Bible become a welcome addition to your faith library, and serve as a continual reminder that the joy of the Lord is your strength!